Fabulous Tours of South Korea! Are you looking to explore the fascinating country that is South Korea? Take a look at our selected range of guided tour itineraries, including all transport and accommodation. There's sure to be one to suit you! Add a Jeju island extension, or we can extend your stay by adding extra days in Seoul either before or after your tour. Let us know your travel dates and we'll sort it all for you. Prefer a Private Tour? No problem! We'll send you a plan to suit your travel dates and requirements. Simply let us know the destinations you'd like to include. And remember, book with us and you have 100% financial protection. Take a look at our Tours Suggestions, then Contact us... We'll take care of the rest! 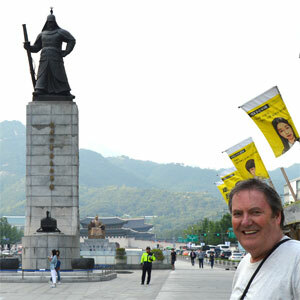 History and beautiful scenery in Eastern Korea are the highlights of this 6 Days tour. South Korea's eastern cities hold 1000 years of rich history, including Gyeongju city, where there are numerous UNESCO World Heritage sites. In addition, you can enjoy a hiking trail through the slopes of the most famous mountain in Korea - Mt Seoraksan. The Western side of Korea presents great cuisine and attractive scenery. On this Western Korea 6 Days tour you will experience the best foods of Korea as well as cultural experiences in famous travel spots. Your guides will accompany you throughout on this food and culture-rich journey. A dynamic country that is steeped in tradition - Korea is the epitome of modern Asia. This itinerary offers an overview of Seoul, the fascinating capital city, Gyeongju, the ancient, beautifully preserved former capital, and the bustling major sea port of Busan. Discover Korea with this Round Korea 9 Days Tour, which takes you to discover hidden treasures around the country, accompanied by a knowledgeable and experienced tour guide. This relaxed and satisfying trip will allow you to experience a beauty only Korea can offer. The history and attractive scenery of eastern Korea are the highlights of this 6 Days tour. South Korea's eastern cities boast 1000 years of fascinatingly rich history, including Gyeongju city, where you'll find numerous UNESCO World Heritage sites. In addition, you'll be able to trek the slopes of the most famous mountain in Korea, - Mt Seoraksan. Old and new Korea are juxtaposed in this tour itinerary which combines the sophisticated excitement of Seoul with Korea's ancient past. You'll also visit the DMZ, the demarcation zone between North and South Korea, which is the most heavily armed border in the world! History and attractive scenery in the western and eastern districts of Korea are the highlights of this Seoul & Round Korea 10 Days tour. South Korea's western and eastern cities boast more than 1000 years of rich history, including Seoul, Gongju, Gyeongju and Andong, where you'll discover numerous UNESCO World Heritage sites. Trek Mt. Seorak - Korea's most famous mountain. Explore the old and new which co-existing together in Seoul, the capital. History and superb scenery in the eastern districts of Korea are the highlights of this tour itinerary. South Korea's eastern cities provide 1000 years of rich history, including Seoul, Gyeongju and Andong, where you can find many UNESCO World Heritage sites. In addition, you can trek through the slopes of the most famous mountain in Korea, Mt. Seorak. The wide plains of Jeju Island are an exotic region, where horses graze. The Cedar Forest Road has been judged as one of most beautiful roads for taking a drive in Korea! History and beautiful scenery in the western side of Korea are the highlights of this tour. South Korea's western cities boast 1000 years of rich history, including Seoul and Gongju city, where you'll discover many UNESCO World Heritage sites. In addition, you can trek the most famous mountain in Korea - Mt. Seorak. On the wide plains of Jeju Island, you can see horses grazing. Cedar Forest Road is ranked as one of most beautiful roads for driving in Korea.